Today I'm doing R&D, so I get to learn about Vagrant, boxes, providers and all the rest. The end result should be a Vagrantfile (plus whatever else I would need) that I can put into a repository, that would make it super easy for me to get HHVM running instead of PHP, have mysql installed, WordPress 3.9 and deploy the whole thing onto a Digital Ocean box. In any case, that was almost a year ago. I'm stepping up my dev game, so I thought it would be a better idea to do VM development that closely resembles production environments. Not sure if the end result will end up on DO, but it looks like a good starting point. It might even be the end result. Updating from 1.4.3 to latest (1.5.3 at the time of writing) solved that issue. Um... okay. After talking to Fabian (@geekproject), it seems the box itself is broken. Great... No DO box for me today. Sometimes the box is broken, and it's not your fault. All right, I'll use the standard box then. This went relatively painlessly. 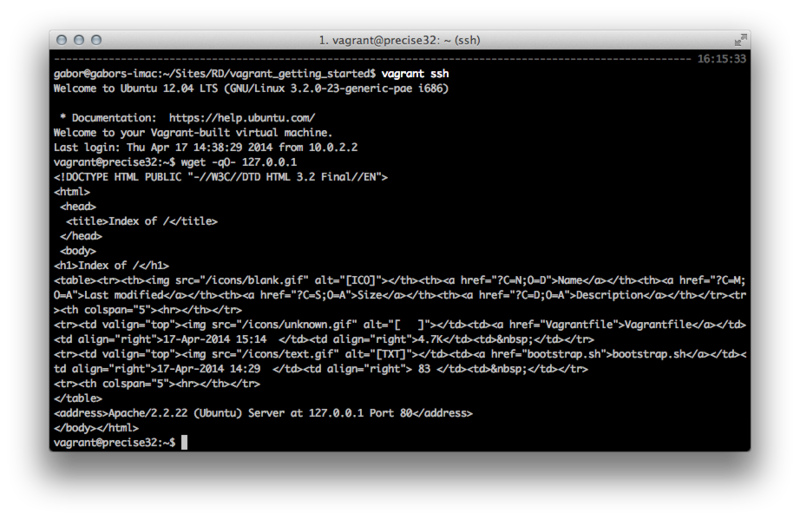 I added the apache2 and removed the /var/www folder, and instead created the symlink to the /vagrant folder. Nothing much to add here on top of the tutorial. 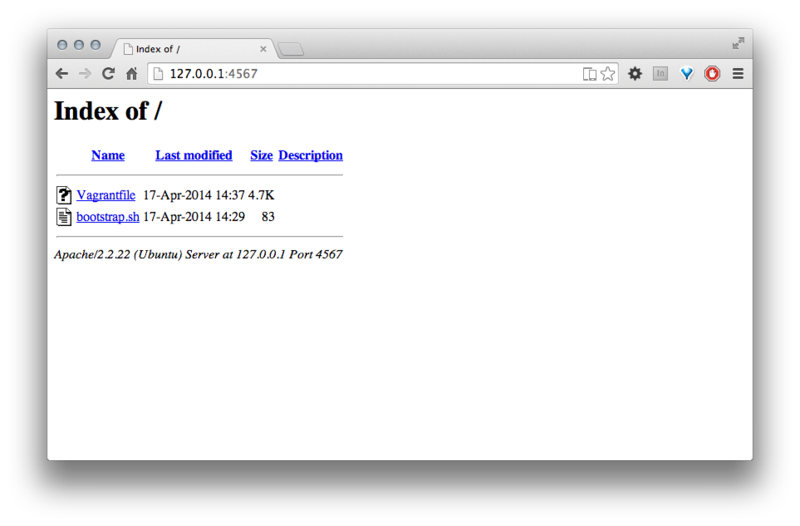 I have MAMP running, so http://localhost points to my computer. The guide says to put config.vm.network :forwarded_port, host: 4567, guest: 80 in the config options, so theoretically opening http://127.0.0.1:4567 on my host machine should open up the welcome to apache page. Here's what's happening though. Um... no website for me. It clearly maps the port to the other port (as at this time MAMP isn't even running), but for some reason it's refusing to serve up the site. It is actually serving up the same thing as the HTML is after the wget in the host machine. So turns out I was an idiot, and what the HTML is in the console in the VM is actually the same as what I'm seeing. Which means, win!